Do any of you remember the episode of Friends where Ross whitens his teeth before a date and the turn out ridiculously white? I mean, glow in the dark, bright as the moon, ridiculously white? I’m not sure what’s up with society’s obsession with white teeth. Just like we get wiser and smarter (hopefully) and more wrinkly (hopefully not) with age, our teeth show signs of wear and tear – it’s natural. Whether it’s from drinking too much coffee or not brushing as frequently as we should, many people have come to despise naturally yellow teeth and have turned towards tooth whitening as a solution. So much so, that tooth whitening is now a part of American culture, which is totally fine with me as long as we don’t go so overboard as to make our teeth look unnaturally white. Unnaturally white teeth to me are like a woman who’s obviously gotten a face-lift. Sure, it looks good, but it’s clearly fake. Rembrandt has a unique line of products that were designed specifically to help people brighten their smiles, without making your teeth glow in the dark. For the past month, two fellow testers and I have tested various aspects of Rembrandt’s Tooth Whitening product line. Rembrandt was invented over 20 years ago specifically to help people achieve and keep whiter teeth. Their toothpastes and mouthwash use the same ingredients that many dentists use – peroxide to help remove stains inside your teeth and fluoride to help restore enamel and fight cavities. The Rembrandt Whitening Treatments product line includes two fast treatments – the 2 Hour Whitening Kit and the Whitening Strips, four different toothpastes, and a Peroxide Whitening Mouthwash. We tested out the whitening kit, toothpaste and mouthwash combined, and the toothpaste by itself. The Rembrandt 2 Hour Whitening Kit comes with two custom tooth molds and eight little tubes of product called “ampules.” To custom shape the molds, dip them into a cup of hot water until they are soft, and then put them into your mouth to form them to the shape of your teeth. 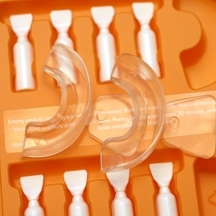 After the molds are perfect for your mouth, you apply a thin line of the whitening gel into the molds. Then you wear the mold for 20 minutes, then take them off for 10 minutes, back on for 20, off for 10, and repeat for a total of 4 times, or two hours. After using the product, our tester definitely noticed his whiter teeth. 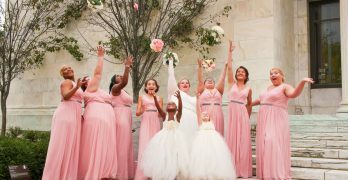 While two hours may seem like a lot, it’s much shorter and well worth the time when you compare it to one or two week programs. (Quick math calculation: 15 minutes a day x 14 days = 210 minutes = 3.5 hours and 20 minutes) After custom fitting the molds and putting in the gel, our tester felt that it was fairly comfortable in his mouth. If you are able to keep your mouth relaxed then you won’t taste any of the gel, and with the molds in, he could still swallow comfortably. If for some reason you did taste a little bit of the gel, he described it as a “pleasant sweetness.” The tester will also tell you that he’s been wanting to whiten his teeth for some time, but was apprehensive of putting harsh chemicals on his teeth that could cause sensitivity. Rembrandt gave warnings about potential white spots on your gums or having sensitivity, but he didn’t experience either of these. One of the other things our tester pointed out was that when you’re done, you’ll have a few “ampules” of the gel left so you can do touch-ups if needed. Final Conclusion: The product was easy to use and you get noticeably whiter teeth after just two hours. 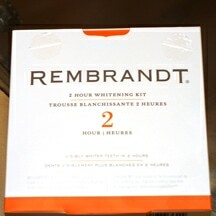 The Rembrandt 2 Hour Tooth Whitening Kit was convenient and a great bang for your buck. For about three weeks, our next tester brushed twice a day with the REMBRANDT Intense Stain Toothpaste (mornings and nights) and after brushing would swish the Rembrandt Plus Peroxide Whitening Mouthwash (about 2 teaspoons for 1 minute.) After rinsing with the mouthwash, they recommend that you don’t eat or drink anything for the next 30 minutes to help keep the product on the teeth. The mouthwash has “rapid-release” hydrogen peroxide to help with the deep stains and sodium fluoride to improve enamel. Our tester felt that using both of these products worked great. The combination of the two made his mouth feel fresh and clean. He was able even able to discern an improvement in color after the first rinse with the mouthwash. He also appreciated the need to wait before eating but felt that it wasn’t an issue and actually liked that the product continued to whiten his teeth for additional time than just when he was swishing. Final Conclusion: Even though it’s been a short period of time, Rembrandt has just earned itself a “lifetime customer.” The tester was so please with the product during testing, that he is going to continue using it and is eager to see the continued improvement in the health and color of his teeth. I’ve been using Rembrandt Intense Stain Toothpaste for about four weeks now. I use it with my electric toothbrush, so I’m brushing with it twice a day for two minutes at a time. 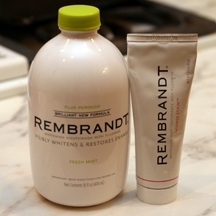 The active ingredient is Sodium Fluoride, which helps prevent cavities, but Rembrandt says it also has “a unique blend of high-performing micro-polishing particles” and stain-fighting ingredients. Usually, when I think polishing particles, I think grainy – but the Intense Stain Toothpaste is smooth, so those must be super-duper micro polishers…maybe even nano polishers! (OK, nerd joke there…are there any engineers in the house?) It provides a nice, minty clean feeling after brushing, but has the benefit of whitening teeth as well. I didn’t see a marked difference in the change of my tooth color, but that could be because I’m using the toothpaste solo. Rembrandt reminds us that when you’re using the long-term whitening treatments, the color changes will be much more gradual and over time when compared to the “instant” whitening of the 2 hour kit. Final Conclusion: Although there wasn’t an immediate result, I felt that the Rembrandt Intense Stain Toothpaste helped keep my smile bright and through continued use would make my teeth whiter. Since it fights cavities at the same time, it’s a great choice to get the best of both worlds – anti-cavity protection and whitening. For more information about the REMBRANDT Whitening Collection or to learn more about any of the products you saw here, please visit www.rembrandt.com. Rembrandt products are available in stores and retailers nation wide from $7.99 (for mouthwash and toothpastes) to $24.99 (whitening strips and 2 hour kit.) The website is also offering $8 worth in coupons for Rembrandt products if you sign-up online. You can also enter to win Rembrandt products to try out for yourself in the WCatDD REMBRANDT Whitening Giveaway! Four winners will receive a collection of Rembrandt products including: Rembrandt’s 2-Hour Whitening Kit, Plus Peroxide Whitening Mouthwash, and Intense Stain toothpaste. Four winners will be selected at random for this prize. Giveaway ends at 11:59 PM EST, January 20, 2010. Disclaimer: This post consists of my (and/or fellow tester) opinions only. Your experiences may be different. No compensation was given for this review/giveaway. I received free Rembrandt and Listerine products from the manufacturer or their representing PR agency to use and test for the purposes of this review. This did not affect the outcome of this review. I'd want to try the 2 hour whitening kit the most because I am inpatient and like quick results. I think the Form Fit Whitening Strips would fit me best. I really would like to try the Rembrandt Intense Stain Toothpaste. My teeth could use some whitening after 20 years of coffee and Pepsi. I like that it actually restores enamel rather than damage it like some products I have heard of. I'd like to try the 2 hour whitening kit because I think it would do a great job. I'd like to try the Form Fit Whitening Strips. No muss, no fuss! I follow you on Twitter at @JennSweepsAlot. I want to try the REMBRANDT® FORM-FIT® Whitening Strips because it seems like a hassel free way to brighten my smile. Thanks. I would like to try the 2 hour whitening kit because I want white teeth for my wedding. I want to try the whitening kit!! The results look so promising!! i would love to try the 2 hour whitening kit the most because I am totally into instant gratification. Seeing results fast makes me want to do the upkeep! I'd like to try the 2 hour whitening kit! I would love to try the Form Fit Whitening Strips. I have awful teeth that I'm very self conscious about! i think this is good site and there are more good thinking! I would love to try the Form Fit Whitening Strips. Seeing results fast makes me want to do the upkeep! i would like to try the intense stain toothpaste.